Sen. Bernie Sanders repeats a Democratic talking point in saying that Social Security hasn’t contributed “one penny” — or “one nickel” — to the deficit. In fact, it contributed $73 billion to the deficit in 2014. Goldwein told us that Sanders’ statement contains a kernel of truth in that Social Security technically can’t run a debt. “That means that any [yearly] deficits it’s running now can only legally be paid because it was running surpluses in the past,” he says. But the government spent the surplus on other things. It owes Social Security the money, which is held in the form of Treasury securities. In order to pay it, the government must cut spending in other areas, raise taxes or borrow from the public. Because current payroll taxes don’t produce enough revenue to pay Social Security benefits, the program is contributing to the yearly deficits. We wrote about this claim in 2011, when other Democrats made the not-one-penny claim. As we said then, Social Security for years brought in more revenue through payroll taxes than it paid out in benefits, lessening the federal deficit and allowing Congress to spend more money in other areas. But that changed in 2010, when benefits paid outpaced revenues generated. CBO’s projections show that Social Security’s balance is expected to grow for several years, but that’s because Treasury must credit the trust funds with interest payments on past borrowing. The government will have to either increase taxes, cut spending or borrow from the public to pay that interest that it owes to itself. This doesn’t mean that Social Security benefits are in danger, at least not in the next few decades. The government can make up that gap between Social Security revenues and outlays with the Social Security trust funds, essentially cashing in Treasury bonds it holds for that amount or using interest paid on those bonds. The Trustees of the Social Security and Medicare trust funds’ most recent report says: “Interest income and redemption of trust fund assets from the General Fund of the Treasury, will provide the resources needed to offset Social Security’s annual aggregate cash-flow deficits until 2034.” At that point, the trust fund would be exhausted. CBO estimated the trust fund would be depleted earlier, in 2029. Once the trust fund is gone, Social Security can still pay benefits — but not more benefits than it takes in from revenue. The trustees say tax income would be able to cover three-quarters of the benefits through 2089. The Committee for a Responsible Federal Budget says that even if Social Security is viewed as an “off-budget program,” it still indirectly adds to the on-budget deficit. 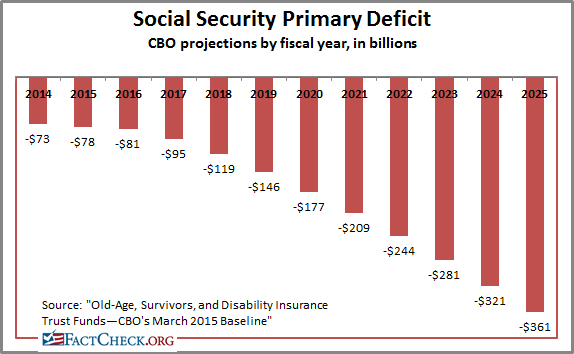 CRFB, Aug. 13, 2015: If viewed as an off-budget program, Social Security does not directly add to the “on-budget deficit.” However, it indirectly contributes to the on-budget deficit because the interest payments it receives from the general fund are on-budget. It also receives funding from income tax revenue on Social Security benefits, which is technically on-budget, and has at times received general revenue transfers to compensate for policies that would reduce Social Security revenue (such as when lawmakers cut payroll taxes in 2011 and 2012). For years, Social Security was a boon to the government’s bottom line, lowering the deficit and even causing a budget surplus in 1998 and 2001. But now outlays outpace revenues, and the government has to use deficit spending to honor its obligations to the program. CRFB issued a report in August, marking the 80th birthday of Social Security and identifying several common falsehoods about the program. It says it’s a “myth” that “Social Security cannot run a deficit.” We agree.